Random 4-pack contains a total of 4 mini-figures. Give your office or TV room a little touch of Disney magic with these Disney Pixar Mystery Mini Vinyl Figures Series 2! This Series 2 Random 4-Pack contains 4 mini-figures, with each standing 2 1/2-inches tall. Some of these characters are from classic Disney films and TV shows like Belle, Beast from Beauty and the Beast, Alice, Cheshire Cat, Timon, Pumba, Simba while others are from Disney Pixar and modern movies like Wall-E and Wreck-It Ralph. 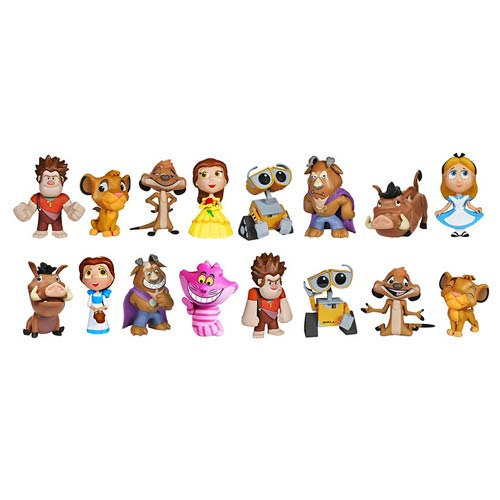 Characters like Belle and Beast from Beauty and the Beast, Simba, Timon, and Pumbaa from The Lion King, Alice and Cheshire Cat from Alice in Wonderland, and more all make their appearance in the Disney Pixar Mystery Mini line of vinyl figures!